A 17-second video clip shows how a man, who was busy talking on the phone, fell right inside. According to Shanghaiist, the hole was 32-feet wide and 6-feet deep. It was also reported that the man wasn't seriously injured in the accident, and actually climbed out of the hole himself. 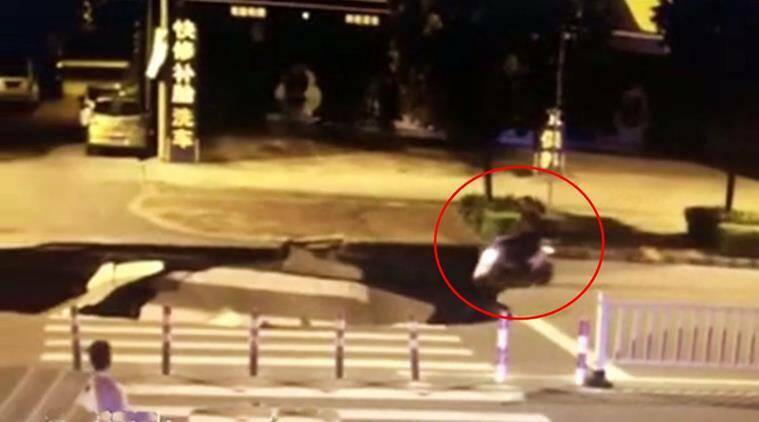 In a shocking incident that took place on Guangxi road in China, a scooter drove right into a massive sinkhole that had suddenly formed. A 17-second video clip shows how a man, who was busy talking on the phone, fell right inside. According to Shanghaiist, the hole was 32-feet wide and 6-feet deep. It was also reported that the man wasn’t seriously injured in the accident, and actually climbed out of the hole himself. Sharing the video on Facebook, the page captioned it: “Massive sinkhole opens up on Guangxi road, oblivious scooter rider falls right in.” The footage has garnered more than 78,000 views and about 1,500 likes. 2 Taylor Swift's social media pages are showing a 'blank space', and her fans are freaking out!